Migrating adults were noticed in DATCP’s black light trap network a few weeks ago. Specifically, in Rock and Monroe Counties. Since those early captures, relatively few have been reported. I’m not sure why. Perhaps it is because of the cooler nighttime temperatures or…………. because there are few migrating moths. Regardless, it might be a good time to review likely fields where spot-checking would be useful. It seems every year someone in the state is surprised by early season armyworm activity. Injury is often widely scattered but can be severe is isolated fields. Knowing those field characteristics which attract egg laying adults can really help target our scouting efforts. Armyworm adults are usually attracted to dense, grassy surroundings to lay eggs, with one exception. Those attractive grassy areas could be weeds, crops and cover crops. Grassy weeds are certainly attractive as are grass cover crops such as cereal rye. Egg laying and/or feeding may start before corn is planted or emerged. Automatically tank mixing an insecticide with the burn-down herbicide is not recommended because effective rescue treatments are available if needed. Conservation of non-target species is important and may provide benefits later. Especially if slugs are a problem. Winter wheat and other dense growing spring seeded small grains may also be attractive egg laying sites. Concentrate scouting efforts in dense cover and/or where lodging has occurred. The exception to the grassy weeds/crops/cover crops rule is corn that is no-tilled into alfalfa. For some reason, armyworms can be highly attractive to this field scenario. Often to the field and/or line within a field. Additionally, in 2015 we had a few reports of stand loss in weed-free soybeans. I am still confused why this happened. It could be an “any port is a storm” type of egg laying circumstance or perhaps armyworms read different books than we do. Insect behavior can be difficult to predict. As you would expect, the economic threshold for armyworms varies according to the crop. However, one commonality is that armyworm are best controlled when under 1-inch long. In wheat, the long established economic threshold is a field average of 3 armyworms/square foot. 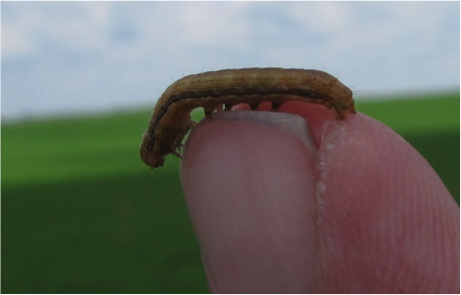 Armyworm larvae are nocturnal feeders and damage from early instars can be hard to detect in dense small grain fields. Look for larvae on the soil surface during the day. In seedling corn, the threshold is a less clear cut than for small grains. In late vegetative/early reproductive corn, the threshold is 1 armyworm on 75% of the plants or 2 armyworms on 25% of the plants. Seedling corn, can be very resilient. In a recent article published by Kelly Tilmon and Andy Michel, Ohio State University, they suggested rescue treatments may be needed if stand infestation is greater than 50% and larvae are not yet mature. I think that is an excellent guideline. FYI, armyworm larvae have a tan head w/ numerous vein-like lines in the compound eyes. Body color and intensity can be very diverse and but alternating light to darker color lines are usually noticeable. Typically, the “belly” is lighter colored than the rest of the body. I mentioned larvae are nocturnal feeders, during the day larvae often rest deep within the corn whorl. Abundant frass in the whorl can be a give-away to their presence. 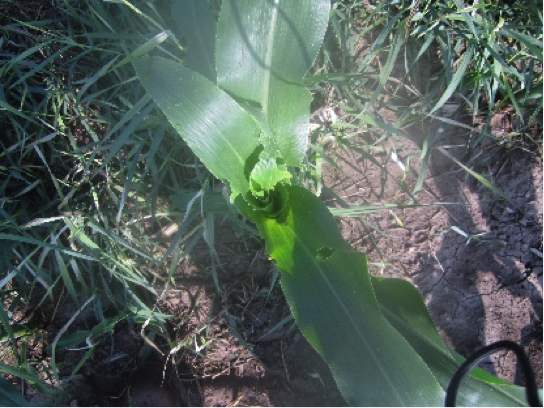 Armyworm defoliate plants by (usually) feeding on leaf margins, although they may chew ragged holes in the leaves.